Scurrying sounds or squeaking can be heard coming from within your walls. Piles of droppings, specifically behind furniture and appliances, around the kitchen, or in the basement or attic. Wooden utensils, household fixtures, and/or food seem to have been eaten or gnawed on. There are rub marks smeared where they may slip into a small space like between a fridge and wall. The rub marks are from dirt and grease on the rat’s coat. You’ve found pockets of nesting made of shredded paper, furniture fabric and stuffing, clothing, and other soft household materials. Your insulation shows signs of being disturbed, and there are chewed or clawed up ducts. Okay, so you might have rats. Can you handle them yourself without the help of rodent control, you might ask? Usually, it’s not recommended. And that’s not just because rodent control is part of our job! Rats are incredibly intelligent for their size. They avoid traps and even attempt to help each other escape if one becomes entrapped. Some rats in the colony are extra-wily and manage to never fall into simple residential rat traps. On top of that, they breed lightning-fast. Their gestation period is short, they have large litters, and they can have their own litters starting at a young age. 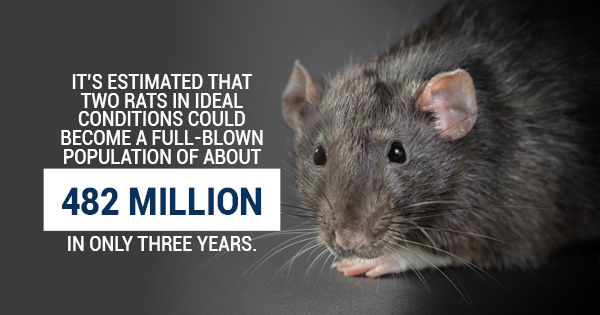 It’s estimated that two rats in ideal conditions could become a full-blown population of about 482 million in only three years. That’s a lot of unwanted rodents. Rats also leave behind a lot of sanitation and safety issues. Damage from animals like rats who hang out in walls, fireplaces, and insulation can even cause danger like house fires. The feces, urine, bacteria, and chewed objects they leave behind can cause major health issues. A homeowner might not be able to safely sanitize and repair all the damage on their own. If you think you have one stray rat trying to take shelter in your warm house? You may be able to take care of it yourself with store-bought traps and the like. But if you are suspicious of multiple rats hiding out, or find evidence of nesting and reproduction? Call an animal removal or rodent control professional, fast. Nobody wants to deal with evicting a whole rat colony squatting in their walls.